Free HANNAH MONTANA GAMES for Girls! 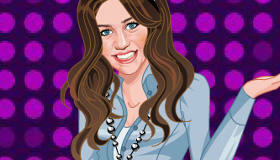 Take part in all the games about your favorite star ! Hannah Montana is a TV series all about Hannah Montana, a young girl who lives a double life. By day she is just like all girls her age; her name is Miley, she goes to school hangs out with friends and leads a perfectly normal life. But the big secret she hides from everyone around her (even her friends) is that she is also a famous pop singer called Hannah Montana. Only her very best friends Lilly and Oliver know her secret, and they try to help her however they can. In this section of girls games you’ll find lots of [Hannah Montana games all about Hannah Montana and Miley Cyrus, and you’ll be able to get to know the TV series much better!